Vivekananada Kendra Arun Jyoti Tezu, service project of Arunachal has organized the Priest felicitation programm on 24th July 2016 at Govt. Middle School, Pomliang. 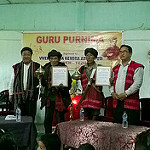 Whiling, Shri Badamso Teyang, President of Mishmi Faith Promotion Society has grace the occasion on Chief Guest, who lighting the lamp with Prayer and felicitations of Mishimi Priest Sri Sotem Kri of Huchaliang Village and Sri Sobru Thedn of Pomliang for their leading and forwarding the old culture values with encouraging mishimi prayer movement System in Tanchaw Klumya. More than 200 person attended the program. Where Tanshow Klumya Committee of Tafrogam, Tezu, Pomliang and Donyi Polo Yalom Kebang tezu had performed prayers of mishim Matai Jowmalo and Adi Gangging Preyers Respectively. The priest was purified by sprit of Holi water calted Tisulti by Mishimi Priest and distribution Nyapo as withal Prasad of Mishimi. Sri Kruleso Ngadong , Nagar Pramukh VKAJ, Tezu on his Kendra Introduction remembers the Swami Vivekanandas life. How a young age grass, Swamiji become the 1st Spiritual Ambassador from Bharat to west and become the champion of World. Religious Parliament Chicago in the year of 1893. He also said that with the blessing of Mananeeya Eknathji Ranade founder of Vivekananda Kendra had founded A Spiritually Oriented Service Mission and in 1974 come in specially for Arunachal 1977 Seven VKV Started Education for Arunachal Boys & Girls with motto Man Making Nation Building, Now Arunachal has having no. than 35 VKVs also spreading other stated like Assam etc. Sri Amoso Khamblai Secretary Misham Faith Promotion Society (MFPS) also spoke on the occasion on Mishimi Prayer Movement. Sri Ashok Atale Nagar Sangthak has given Speech on Importance of Guru Purnima. He said Guru Purinma is one amongst the five occasion of Vivekananda Kendra Which to Prayed and respect the guru or priest. Chief Guest Sri Badamso Tayeng appreciated the VKAJ organizing committees for felicitation the Priest and assessed the MFPS will allayers with VKAJ for preserving age old culture values of the society program ended with vote of thanks and prayer.